Milk Paint has been around for a long time, but why are we hearing more about it these days? Milk paint gives furniture an aged and antique look that you don’t get from latex paint. It is also easy to distress. Many people are painting old pieces of furniture with milk paint, giving it a modern, and aged rustic appearance. Milk paint is one of the oldest forms of paint, found in pyramids, thousands of years ago. If you own old antique furniture over 100 years old, most likely it was painted using milk paint. It is called milk paint because the key ingredient is casein, the protein found in milk. I am going to paint these candlesticks I bought from Home Goods many years ago, using milk paint. Milk paint is often sold in powdered form, which requires mixing with water. It is also sold in liquid form, which is what I used (HERE), in the color Petticoat. I want to paint these black candle sticks white. Using a fine grit sandpaper, I lightly sanded the candlestick just to rough up the surface. I don’t think this is required, since I used a bonding agent (HERE), but sanded lightly just to be sure. I applied a thin coat of the bonding agent (HERE) to the candlestick using a brush. Let the surface dry completely, approximately an hour. A little milk paint goes a long way. I started at the top of the candlestick and worked my way down, it didn’t require much paint at all and was very easy to apply. It took less than 5 minutes to paint these sticks. The paint adhered very well to the surface. The paint was easy to get into the grooves of the candlesticks. I wasn’t too particular in getting every nook and cranny, it’s ok if some of the black shows through, giving it an aged look. This is what they looked like after 1 coat, still wet. I am starting the second coat now. This is after 3 coats, still wet but looks great. They look beautiful and have a nice chalky appearance once completely dry. Check back in a couple days to see these babies in action, taking center stage in a simple and elegant tablescape. Despite taking some art classes and painting here and there, I have never heard of milk paint! Now I know enough that I might use it on my new little DIY. Be on the lookout! I hope you do! 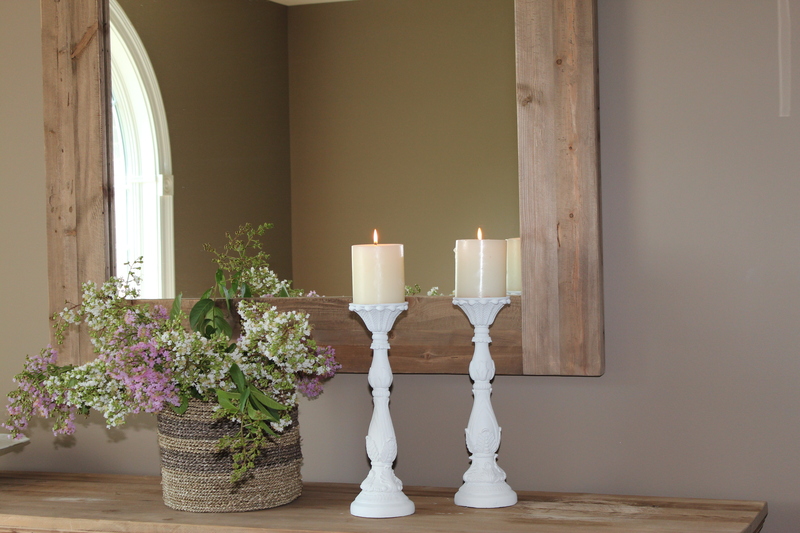 Stay tuned next week for more DIY milk paint ideas. absolutely an interesting project, small and easy to do. Thank you for the inspiration. They are gorgeous your candle stands! I love the finished look of them.